The world of sport is continually changing over the years, and the use of technology is just one of those areas that has made an impact on many sports in the modern day. See the annual sports technology awards for the latest technology ideas in the world of sport. One criticism of the use of technology is that it can slow down the speed of the game, but on the other hand for many people it makes watching it more enjoyable to see the correct decisions being made. Most professional sports in the United States have long used instant replay and other high-tech aids to help referees make the right call. Gridiron has used video replay systems to check referees' calls for many years. Basketball referees use replay systems to make sure players are shooting within the time allotted by the shot clock. In international cricket, the third umpire has been used, one sitting off the ground with access to TV replays of certain situations (such as disputed catches and boundaries) to advise the central umpires. The umpires out on the field are in communication via wireless technology with the other umpire. The third umpire is also asked to adjudicate on run out decisions, which he makes without consultation with the two central umpires. One sport that has resisted the use of high-tech assistance until very recently is soccer/football. Replays could be used to decide off-side decisions, whether a ball passes over the goal line, and clarify penalty decisions. Hawk-eye is the name of a computer and camera system which traces a ball's trajectory. It is being used in international cricket and tennis, and many other sports are also looking at making use of this technology. The system is also being trialled in soccer as part of the goal line assessment. The Premier League of Football in the UK has agreed to the introduction of goal-line sensors after being given approval by football's rule-makers. The system being developed by the UK company Hawk-Eye, would give a definitive decision on whether the ball had crossed the line. The Hawk Eye uses a camera taking 600 frames a second on the goal-line, with the information is analyzed by computer and sent to the referee's headset or a device on his wrist. 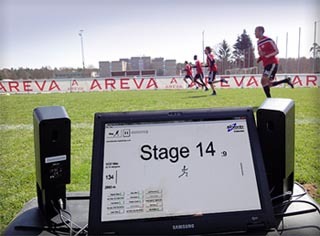 In 2015, Hawkeye technology was also used by rugby officials at the 2015 Rugby World Cup, to improve decision-making by the television match official (TMO) and also assist with player safety. In this case it is enhanced video review, rather than the ball tracking technology as used in other sports. Basketball - the NBA uses replay vision to review 'last touch' decisions in the final two minutes of games, and also to determine whether players release the ball before the shot clock expires. Cricket - technology in cricket has been driven by advances in the TV coverage. Things that were once extra information provided by the TV networks are now being incorporated into the decision referral system (DRS), such as hawk-eye and hot spot, and maybe even the old favorite snicko. See more about Cricket Technology. Aussie Rules Football - umpire review system has also been implemented in AFL, with an off field umpire in certain circumstances adjudicating on whether the ball passes over the goal line or is touched, using video evidence via multiple camera angles. See more about Technology in AFL. Baseball - In 2014 a challenge system was put in place for the MLB to use replays to challenge certain umpiring decisions. See more about Technology in Baseball. Cross-Country Skiing - There have been large advances in the sport of cross-country skiing, particularly with equipment design. See more about Technology in Cross-Country Skiing. Rugby Union - In 2015, Hawkeye technology was used by rugby officials at the 2015 Rugby World Cup. The video review technology with synchronised camera views was used to improve decision-making by the television match official (TMO) and also used by medical staff to assist with player safety by identifying possible concussion instances and behind play incidents. Rugby League - The NRL was an early implementer of using the video referee to help adjudicate questionable tries. There are numerous software packages that are designed for fitness and nutrition professionals to organize data and produce reports, ideal for visitors to this site. Here are a couple of packages that come recommended by Topend Sports. BodyByte — a universal standalone computer software program specially developed to comprehensively organize and manage all the information associated with nutrition, training and fitness. The Future of Fitness Testing - technological advances affecting fitness assessment. read the Sports Technology entries on the blog. 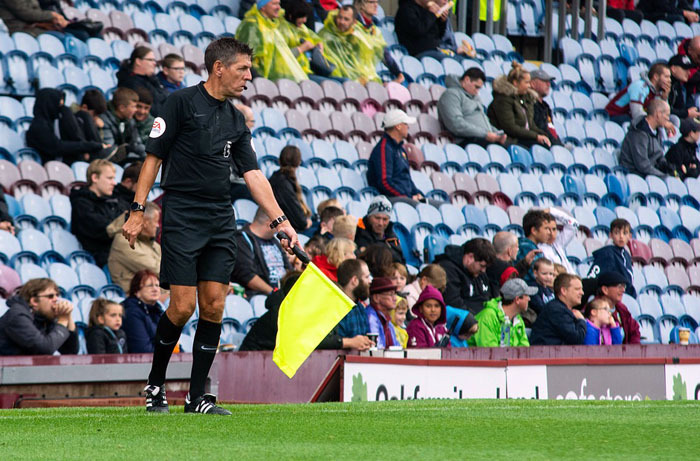 poll: Should Soccer use a video referee?